Since the new movie has came out, Beauty and the Beast parties have become even more popular on Catch My Party! It's our most popular Disney princess theme! Well, if you're looking for a easy treat to serve at your upcoming Beauty and the Beast party, take a look at these chocolate covered pretzels! They're simple to make and your guests will love them! Place each color of the candy melts in a microwave safe bowls. Add ¼-½ teaspoon of coconut oil. Dip the pretzel rods into the candy melts and use a spoon to scoop the melted candy to cover ¾ of the pretzel. 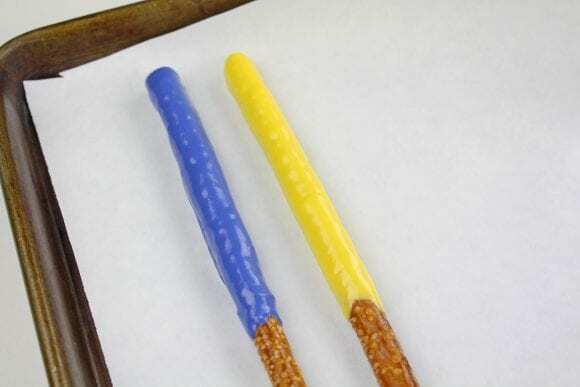 Gently tap off excess candy and lay the pretzel rod on the parchment covered baking sheet. 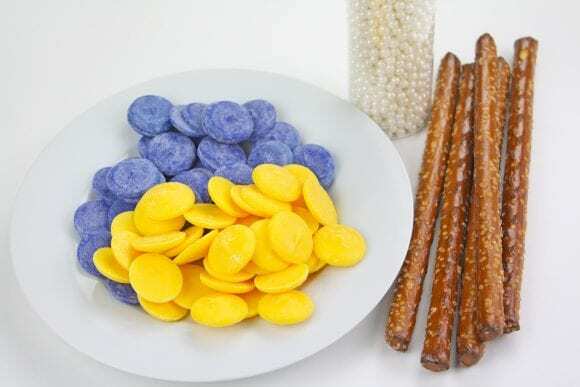 If you would like to add sugar pearls to any of the pretzel rods (ones that won’t have the drizzle melts), gently press the sugar pearls into the melted candy on the pretzel. Place in fridge to cool. 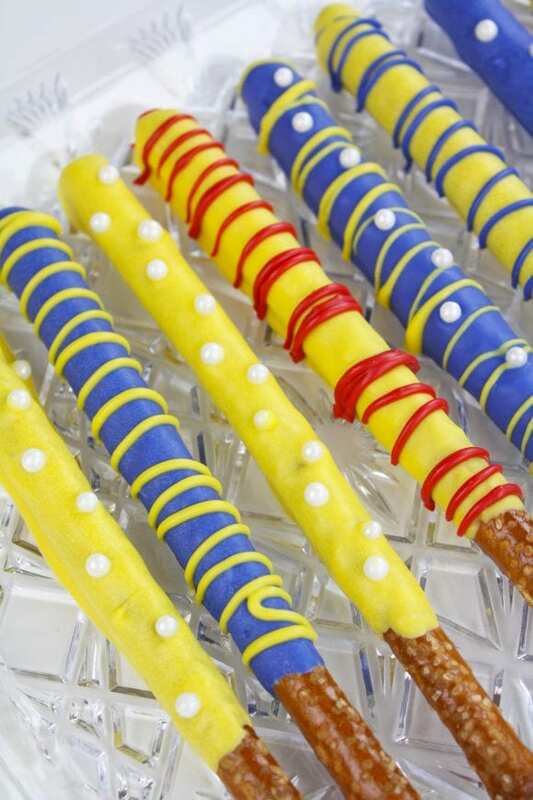 Remove chilled pretzel rods from fridge. 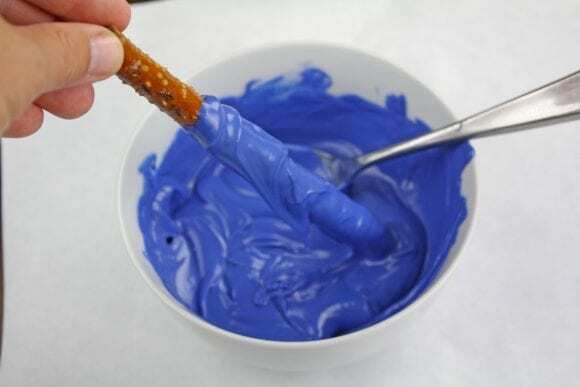 Pour remaining melted candy into a ziploc baggie and cut off the tip. Drizzle the remaining candy melts on the remaining pretzel rods. Add sugar pearls to the drizzled pretzels. Place back in the fridge to harden. And there you have it! 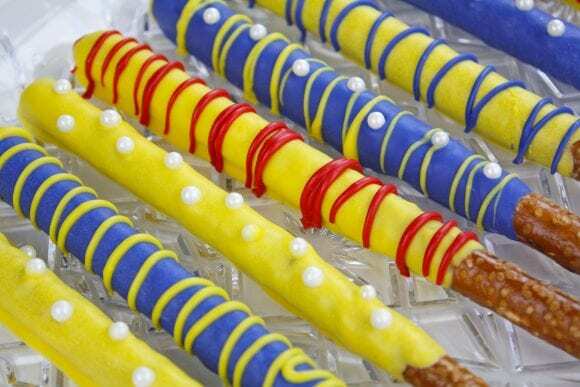 The prettiest Beauty and the Beast pretzels ever! 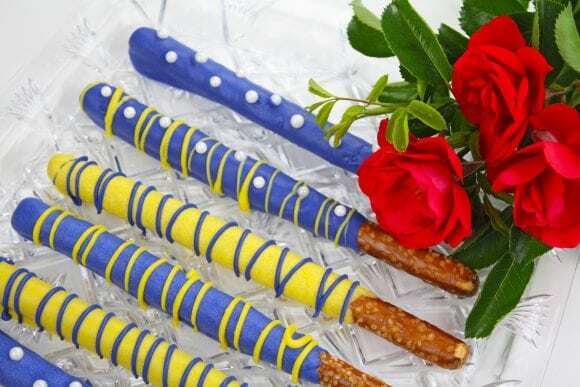 For more inspiration, check out all theBeauty and the Beast parties on our site and our Beauty and the Beast party supplies. This fun food craft was created by our style contributor, Shauna at Ella and Annie. Check out her work on her blog and on Instagram, Facebook, Pinterest, and Twitter.